It’s the vacation week, and since I have time off as well, I’ve decided to take my eight-year-old daughter to a few local museums, starting with the Museum of Fine Arts. She’d seen it several months ago when my friend and I took her to see the “Think Pink” exhibit. She liked the “Pink Room,” and spent quite a bit of time looking at the pink dresses, shoes, suits, and doll clothes, but didn’t care too much for paintings and other collections. This time it was just me and my daughter, going with another girl, who supposedly really liked the Egyptian area, especially the mummies. So off we went, with a library pass that allowed me to pay only $10 to get in, instead of the normal admission price of $25. If you’re traveling with kids, remember that kids 17 and younger get in free after 3pm on weekdays, any time on weekends, or during Boston public school holidays (I’m not sure if that includes the summer vacation). Otherwise, if you want to visit during the week, that would cost $10 per kid over six years old. Can you ever see the MFA for free? If you’re in Boston on a Wednesday, wait till 4pm to visit, because on Wednesday the MFA offers free admission after 4pm, though they do mention a suggested voluntary donation of $25 on their site. Monday, May 25, 2015 (Memorial Day Open House). If you’re an “eligible” college student enrolled at a “participating” college or a university in Massachusetts, New Hampshire, or Vermont you can see the museum for free as well, if you have a valid student ID. Check the list of participating institutions to see if your college qualifies. And if you’re an active-duty, National Guard, and Reserve military personnel, you and your family get free admission year round. The Museum of Fine Arts in Boston is pretty large, so plan several hours, better yet the whole day, to see everything if you want to see it all. That is, if you’re without kids, or if your kids are interested in art. Otherwise, your visit, like mine, will probably be shorter. Included in the MFA’s collections are artworks from Europe, the Americas (including pre-Colombian), Asia, Africa and Oceania, and both ancient and modern pieces. And mind you, some art is displayed in random places, like these figures suspended from the ceiling in the contemporary art wing. You can get a glimpse of the MFA’s holdings by browsing the “Collections” section on the museum website. 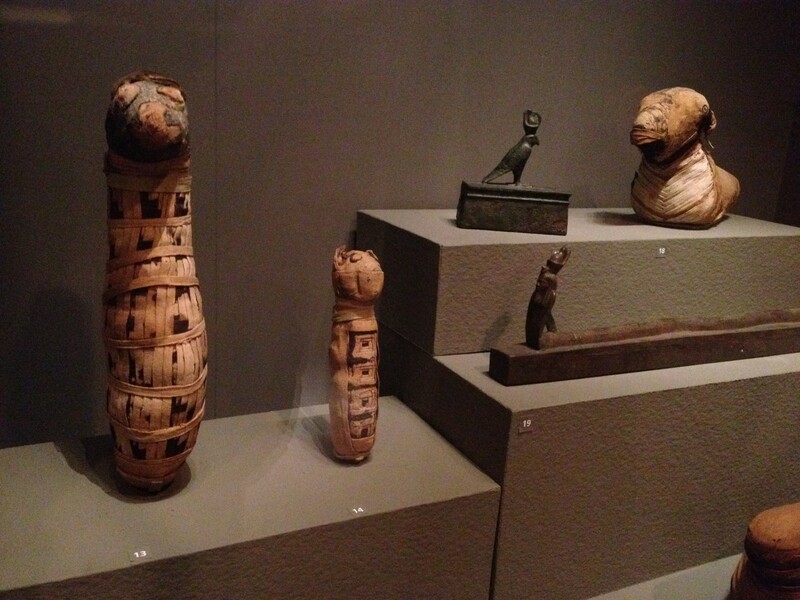 Since my daughter’s friend liked the mummies the most, we headed first to the Art of the Ancient World. 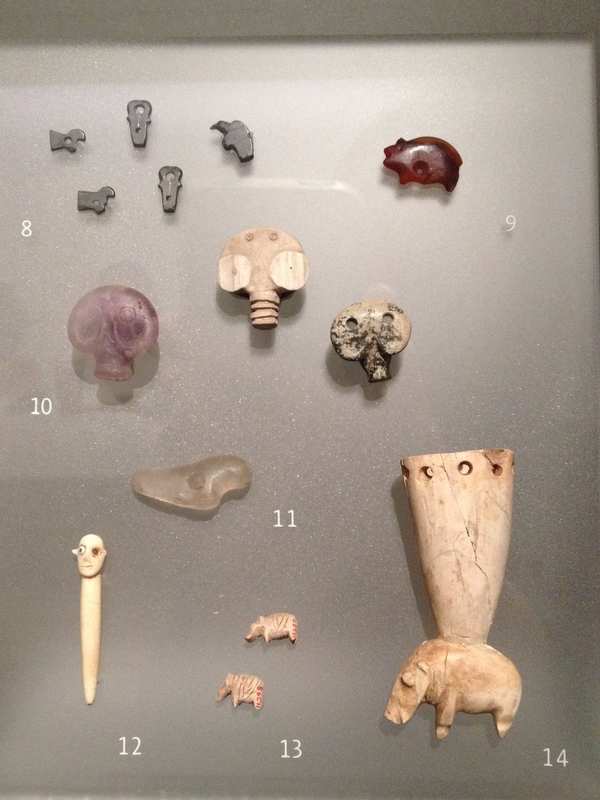 The girls didn’t pay a whole lot of attention to the ancient amulets, but I thought they were pretty cool, considering they were over five thousand years old. an ancient Babylonian circular seal (on the left) and the print (on the right), can you see a goat in this seal? an ancient Babylonian seal, can you see the dog? Because we visited during the Winter Vacation Week, the museum was offering several kid activities in various rooms throughout the museum. The girls decided to do the “Winter Scenes” activity and happily spent over an hour painting their own snow scenes. The activity took place in a large room with several long tables covered with brown paper. There were dozens of aprons for kids to use, and the room was staffed with three young women who were very helpful with distributing paint, showing how to get the last drop of paint from the easels, and mixing paint to make brown. The conference room next door was set up to let the “masterpieces” dry. Overall, the MFA offers many Kids and Family Programs throughout the year. Take your pick. After the girls were done with painting their own landscapes, during which we talked a bit about painting techniques, I took them to the second level to show them first hand the different techniques Van Gogh and Signac used in their paintings. 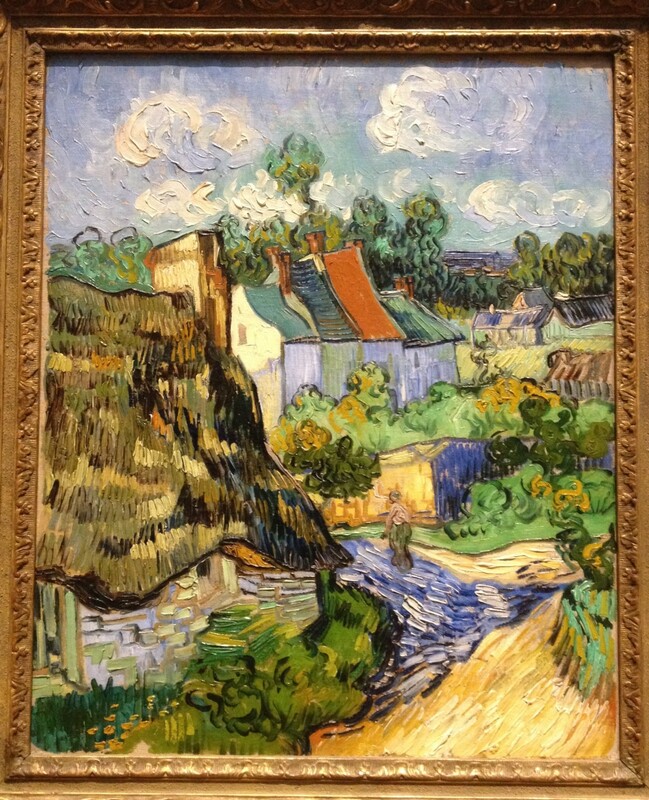 We talked about how a photograph of Vincent van Gogh’s “Houses at Auvers,” while still quite striking and colorful, definitely isn’t as interesting as the original, since a photo reproduction unfortunately flattens this amazing, three-dimensional painting. 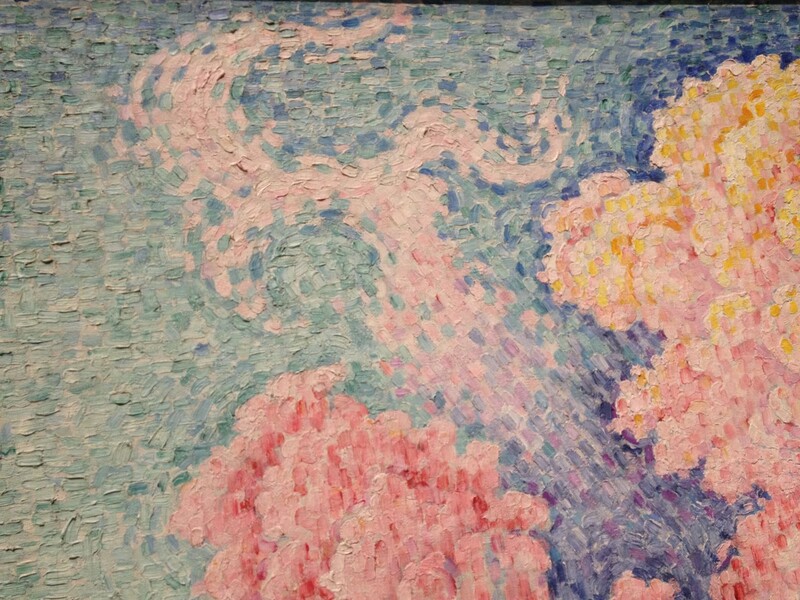 We also stopped by Paul Signac’s “Antibes, The Pink Cloud,” where I asked the girls to look at the brush strokes and examine whether all go in the same directions or many different directions, and what kind of effect that creates. It was close to 3pm by then. We’d been at the museum for around four hours, and the girls have had it, so we left. However, both of them declared they had a lot of fun. The Museum of Fine Arts in Boston is located at 465 Huntington Avenue. I plugged into my GPS 26 Museum Road, the address of a building nearby on the Museum Road, because I wanted to park in the museum parking lot, all of which have entrances on Museum Road. I also wanted to avoid driving down Huntington. The museum parking fees are rather steep. We paid $28 because we were at the museum for more than three hours (though even that would have cost $24). There are parking meters along the Fenway and Hemenway Street, so if you’re driving, you can try your luck finding a spot by a parking meter first, which would be much cheaper. If you’re staying in Boston, you can also take the Green E line to the museum. It may be a bit time consuming, because the Green Line is mostly above ground and is very slow, but would probably be the cheapest way to get there. You can find all the details about visiting the museum on their “Getting Here” page. 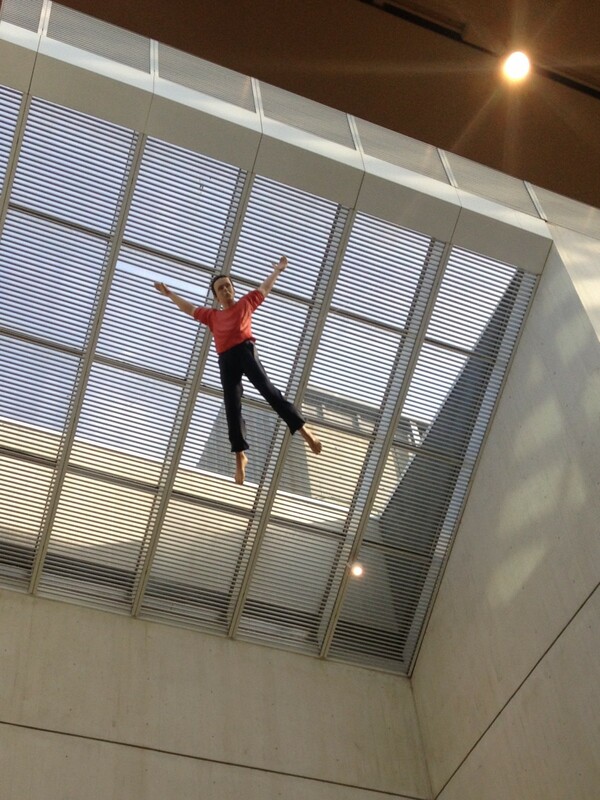 Whichever way you get to the Museum of Fine Arts in Boston, have fun, with or without kids! Since we are local to the area, I can’t really recommend a specific place to stay, since we usually come into the city for just a few hours and then go home for the night. But be assured, there are PLENTY of choices – TAKE YOUR PICK! Lots of interesting travelers hanging out on that page. If I have time, I’d love to see MFA while I’m hanging out in Boston after WITS! I hope you will get to see it! If you can stay till Wednesday, you could get in for free, but all in all, it’s worth the admission price. I also wonder whether we’ll get a Boston CityPass or a GoBoston card 🙂 That would be fun. When i was studying in Northeastern I always wanted to visit MFA, but it was closed for construction, I think I should go there soon now. Yes, you definitely should go there soon, if you’re still in Boston. Even if you’re not, I hope you can still visit soon as well. As a history major I’m always keen to check out museums in whatever town I’m visiting! This museum is definitely up my alley! Here’s to hoping I’ll be able to catch the Think Pink exhibit! Thank you for reading, Andrea! 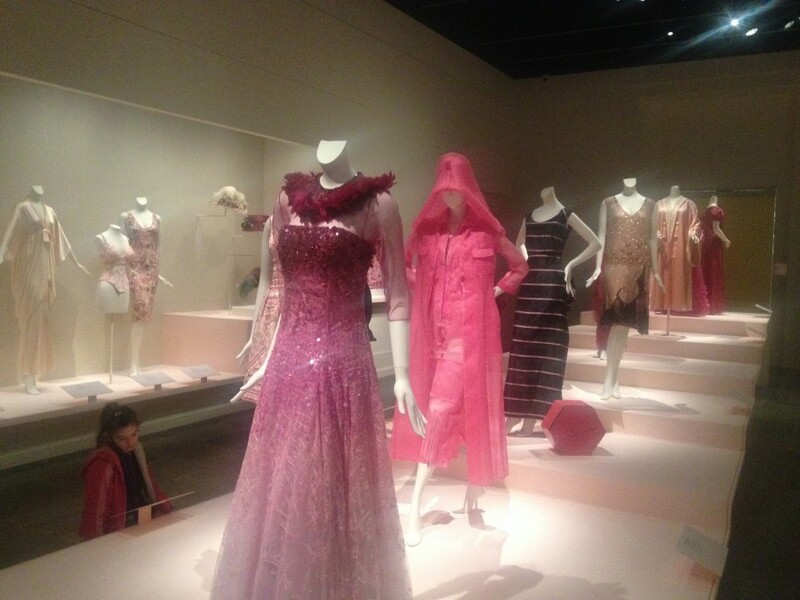 Unfortunately the “Think Pink” exhibit is already over. I’ve uploaded a few photos I took at the exhibit to a Flickr album – https://www.flickr.com/photos/casualtravels/sets/72157649692762450/. The museum is worth seeing nevertheless. And if you’re a history major, then you definitely need to see Boston and the area! Wow. That looks like a very interesting museum. The amulets and the babylonian seal, so gorgeous! Definitely on my map for when I visit Boston! Thank you for reading, Revati! I do hope you’ll get to see Boston some time. The MFA is very nice and there are plenty of other places to see as well. It looks like such a fun and educational place to take the kids! Glad you can get reduced ticket prices, too! Thanks for linking up with #WeekendWanderlust! Very comprehensive post, museums play such an important role in connecting people with their heritage and educating visitors about the place they are visiting. But the best part I liked about this post was that it talks about kids, whom most people tend to take only to theme parks. I will sure visit again to your blog. thanks. Thank you for reading, Prasad! We’ve been to a few theme parks, but we’ve also taken our kids to plenty of museums over the last couple of years. They haven’t always been thrilled about that, but I can see their way of looking at art has been changing since we started talking about the paintings as we walk through a museum. I do hope you’ll keep reading 🙂 Plenty of other museum-related posts to come.